Real estate barons Robert and Philip Ng, Facebook co-founder Eduardo Saverin, and paint tycoon Goh Cheng Liang retain their top three spots in the 2018 list. The combined wealth of Singapore’s 50 richest tycoons has swelled 11 per cent to nearly US$116 billion (S$157 billion), up from US$104.6 billion last year, according to the Forbes Singapore Rich List 2018. Seeing the biggest dollar gains were real estate barons Robert and Philip Ng, as well as Facebook co-founder and Singapore permanent resident Eduardo Saverin. 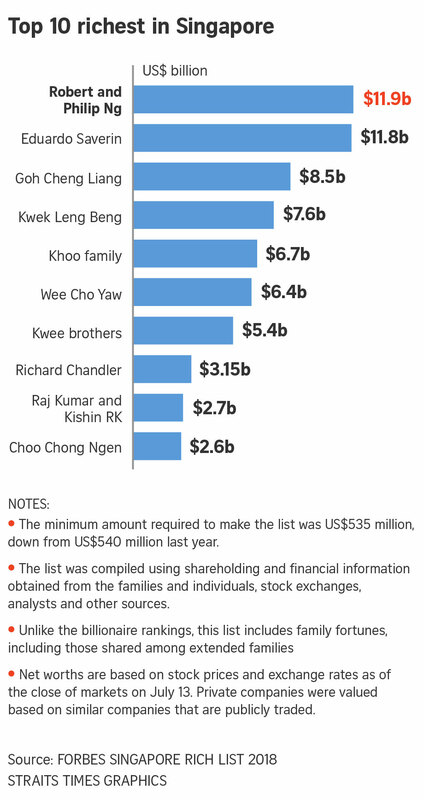 The Ng brothers, who are behind developer Far East Organization, retained their top spot on the list for the ninth straight year with a net worth of US$11.9 billion, up US$2.5 billion from last year. Mr Saverin remains a close second with a net worth of US$11.8 billion, also up US$2.5 billion this year. Retaining the third spot is paint tycoon Goh Cheng Liang, whose net worth rose US$700 million to US$8.5 billion. Mr Goh has a 39 per cent stake in Japan’s Nippon Paint Holdings, and his son Goh Hup Jin was named chairman of Nippon Paint in March. Regaining a place in the top 10 is New Zealander and Singapore permanent resident Richard Chandler, who jumped four places to number eight with a net worth of US$3.15 billion. His Singapore-headquartered Clermont Group’s net assets surged 50 per cent on undisclosed investment gains, according to official filings. This year’s list includes three newcomers. Ranked 32 with US$1 billion is China-born Singapore permanent resident Gordon Tang, who has a controlling stake in listed property firm SingHaiyi Group. At number 34 with US$910 million is Bangladesh-born Singapore permanent resident and chairman of Summit Group Muhammed Aziz Khan, who plans to list his Summit Power International on the Singapore Exchange. Coming in at number 42 with US$738 million is Forrest Li, who listed his online gaming firm Sea on the New York Stock Exchange in October 2017. The minimum amount required to make this year’s list was US$535 million, down from US$540 million last year. The full list can be found at www.forbes.com/singapore. Is print dead? Forbes CEO Mike Perlis doesn’t think so.